On the 22nd November 1963 one of America’s most important and controversial presidents was sitting in the back of a 1961 Lincoln Continental four door convertible as it made a wide turn onto Elm Street at Dealey Plaza, Dallas. His journey was part of his official tour of Texas and a great many people had lined the roads to see their president pass by. As the car rolled through the open grassy area of Dealey Plaza a man standing by the side of the road opened an umbrella even though it was a bright sunny day with no sign of rain. Seconds later John F. Kennedy was shot and killed becoming the 4th United States President to be assassinated. The Umbrella Man perfectly positioned to fire a flechette at JFK. Note the umbrella is open and the umbrella rib is aligned with the President. As the motorcade accelerated away and raced for Parkland Memorial Hospital the Umbrella Man stood motionless for a few moments, calmly closed his umbrella and sat down on the pavement. For a few minutes he spoke to another mysterious man before coolly walking away in the direction of the Texas Book Depository – the building from where Lee Harvey Oswald had allegedly fired the shots that killed Kennedy. All of this has been recorded on film. 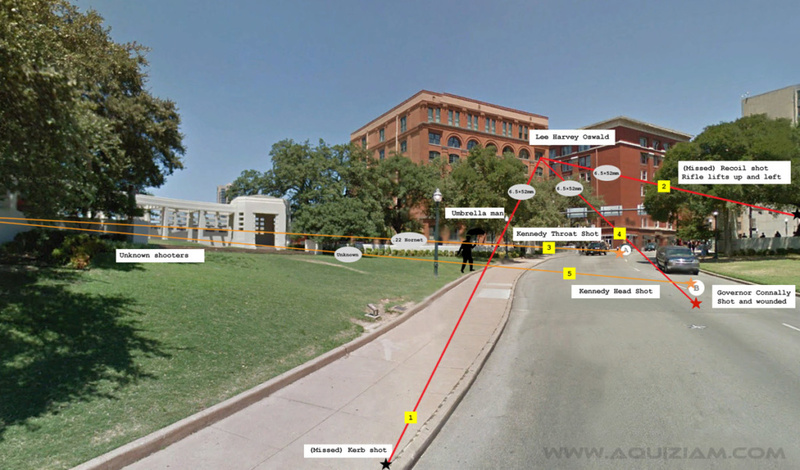 Picture of the Umbrella Man siting on the retaining wall / upper pavement kerb moments before he walked of in the direction of the Texas Book Depository – the same direction in which he is looking in the image. At the time the Umbrella Man and his actions were overlooked by the Secret Service who were more concerned with trying to protect their already dead president. However, as the investigation began photos and films of the event were studied the Umbrella Man became a person of interest and significant covert efforts were made to find him. They failed and were not pursued as officially Lee Harvey Oswald was the lone shooter. There are several key theories as to the purpose of the Umbrella Man. Most believe he was part of the conspiracy and was there to signal to the shooters that Kennedy was definitely in the car and which car he was in. Other people believe that the umbrella was actually used to shoot a dart (flechette) at the President to disable him. A third group believe he was there with an umbrella so that the shooters could judge the wind direction – an essential in sniper marksmanship. This article isn’t about whether these theories are true or not. It is about whether the presence of the Umbrella Man has ever been properly explained. If the Umbrella Man still hasn’t been accurately identified after 50 years then it must be assumed that his actions on that day were sinister and therefore so were those of the Dark Complected man. This would confirm that there was a far more elaborate plot behind the assassination of JFK and it is therefore probable that this has been covered up by various authorities. 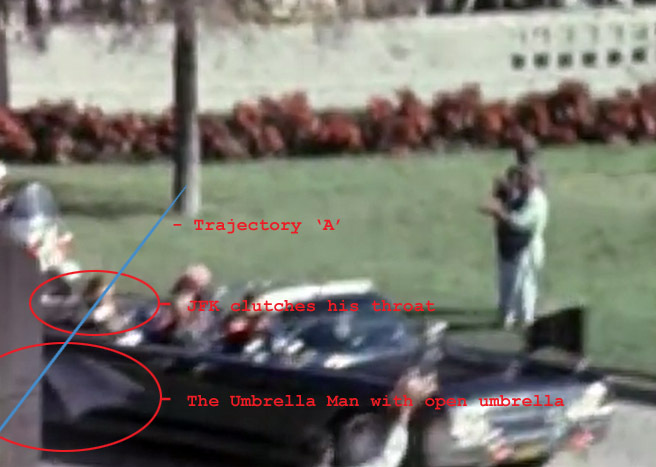 If the Umbrella Man has been identified then it is one less bullet in the smoking gun of the conspiracy theorists. At the time of Kennedy’s death the media was strangely willing accepted the official story that Oswald had been a lone-shooter with psychological issues and a hatred of America. However, the general public spontaneously felt that there was something horribly wrong with the official version of events. It is often overlooked but critically important that at the time of the assassination the CIA was very active with Operation Mockingbird – a programme designed to control and manipulate the mainstream American media. This programme was not wound down until 1965 and officially shut down until 1976 after George W. Bush was appointed head of the CIA in the same year. Still, many people including historians, government researchers, publishing houses and the news media themselves believe the programme was continued under another name. During the 15 years following the assassination of JFK numerous individuals – from the public and government – tried to piece together the true story of what happened in Dallas on 22nd November 1963. The Warren Commission (1963/64) had failed dismally to convince the public that Lee Harvey Oswald acted alone and The Jim Garrison investigation (1966/69) revealed so many unanswered questions that around 50% of all Americans became convinced that the death of Kennedy was the result of a wide reaching conspiracy and that Oswald, as he had claimed, was just a patsy in a greater but covert political struggle. The House Select Committee on Assassinations was established in 1976 to deal with the public concerns over the Kennedy assassination as well as the more recent assassination of Martin Luther King, Jr. The committee, based on acoustic recordings of the gunfire, concluded that Kennedy was probably assassinated as the result of a conspiracy but not by any of the groups being proposed in almost all of the popular conspiracy theories of the time. LOUIE STEVEN WITT – THE UMBRELLA MAN? During the House Select Committee on Assassinations pamphlets were issued asking for information about various people who had been present at the shooting. A man by the name of Louie Steven Witt was identified by his friends as the Umbrella Man and this became known to the media and then the authorities. Witt then voluntarily agreed to attend the HSCA hearings to assist the investigation and, in part, to clear his name. He asserted he was, at the time, employed by the Rio Grande Insurance Company and had opened the umbrella as a protest against Joseph Kennedy’s policy of appeasement with regard to Germany prior to WWII. He stated that John Kennedy, who had written a paper ‘Why England Slept’ regarding Neville Chamberlin’s appeasement of Adolf Hitler while at university, would recognise the umbrella as a metaphor for political weakness. Witt even produced an umbrella that he claimed was the same one he had opened 15 years earlier and that seemed to close the mystery of the Umbrella Man. Bullet trajectories at assassination of JFK – 3 Shooter Model – agreed to be the most practical and certain of achieving success. NOT EVERYONE WAS – OR IS – CONVINCED! Not even the pro-debunking HSCA was overly convinced. During their questioning, members of the House Select Committee on Assassinations seemed to treat Mr Witt with some amusement as if they had already discounted the importance of the ‘umbrella Man’ in the assassination. However, one committee member – Mr. Fauntroy – suggested that in the films and photos Witt had acted with exceptional calm. He stated: I must admit that my reaction to the picture by which you were ultimately identified was one of a very cool cat, That is, you look rather cool there to me.” By this line of questioning Fauntroy was challenging whether the Umbrella Man and Witt were indeed the same individual. When the other members of the committee couldn’t be bothered to pursue this questioning the matter was allowed to pass. It is generally agreed that one of the main purposes of the HCSA was to debunk ‘crazy’ theories regarding both assassinations. With regard to Witt, the umbrella, his position, his behaviour after the event and his apparent 15 year absence the HSCA investigated the matter further by doing absolutely nothing! Witt was never formally investigated or deposed. Members of Witt’s family and friends were never formally questioned. There is no evidence that any government agency checked out his story in any way. The age of the umbrella displayed was never forensically confirmed. Detailed statements of the event he witnessed were never taken. In fact, the HSCA seemed to have accepted Witt’s testimony as gospel and allowed him to swiftly return to the obscurity from where he came. This incredible investigative omission is perhaps the most bizarre and mysterious aspect of the case. 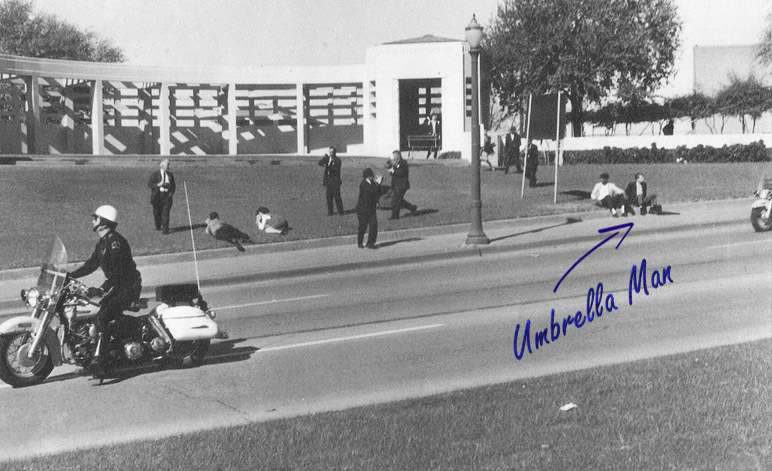 A careful digital comparison of the Umbrella Man in the photos and films recorded on the 22nd November 1963 and Louie Steven Witt remains inconclusive. Even with digital enhancement it has not been possible to prove photographically that they are one and the same person. We only have Witt’s word for it! Witt’s statement that he was the Umbrella Man has never been able to be corroborated by any other individual other than Witt himself. Why did Witt take so long to come forward? According to Witt he was a very private individual and took little interest in JFK or the assassination after the event. It was only when the HSCA put out pamphlets calling for witnesses and information that he realised he was the mysterious Umbrella Man. Although this statement was blindly accepted by the HSCA this seems patently absurd in retrospect. Psychologists point out that he was one of the closest people to the presidential car when Kennedy was shot and the event and would have had a major emotional impact. In light of this it seems absurd and unbelievable that Witt would not have followed the case in the media and been aware of the conspiracy theories that were emerging. Indeed, people from Dallas recall the assassination being one of the main topics of conversation for many years after the event with people often recalling exactly where they were when the president was killed and what they were doing at the time. Not a single individual has ever come forward to state that Witt had previously commented that he had been in Dealey Plaza and that he was the Umbrella Man. This the photograph that proves that Louie Steven Witt lied to the House Select Committee on Assassinations when he stated he never actually saw Kennedy shot. This was an incredible statement to make (and be believed) as the photographic evidence clearly challenges Witt’s description of his actions at the exact time when the shots were fired. 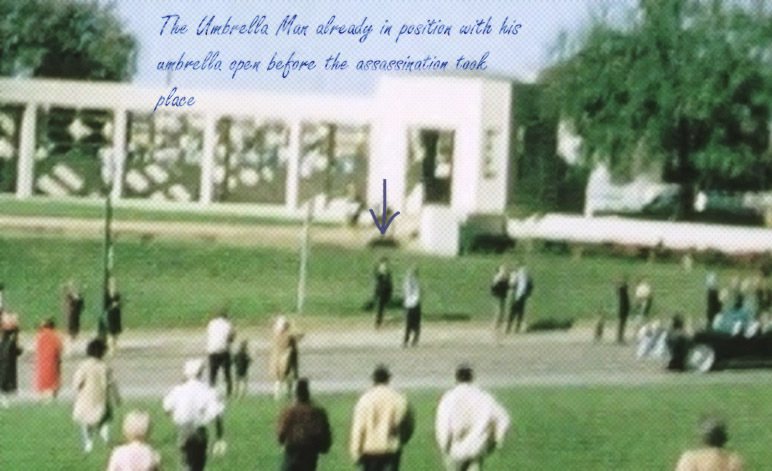 It is obvious to anyone who has viewed the films taken on the day that the Umbrella Man was already in position with the umbrella open (and raised in the air) prior to the shots being fired. Moreover, he would have had the best personal view of the assassination of almost anyone there. He hadn’t planned on doing his protest until the morning of the Kennedy visit. He didn’t know the route of the motorcade. Apparently the man he sat down next to was African American not Hispanic or Cuban even though the film clearly shows otherwise. The man said: ‘They done shot them folks–something to this effect” – Not they shot the president. Sat on the kerb (retaining wall) for three minutes and never once looked around – particularly towards the Grassy Knowle which had attracted the attention of so many others. Witt claimed to have been a protester but could not describe being a member of any organisation or having ever taken part in any kind of protest before. Witt used highly uncertain (conditional) language and terms such as ‘I think’, ‘that may be’ and ‘that seems to be me’. Operation Mongoose was about Kennedy’s agents hunting down Communist ‘snakes’ in Cuba and getting rid of them. Status: Very but not completely successful. Apparently these names do have a purpose which is as a form of code that other agencies will understand. More about this another time. Just for fun then take the name Louie Steven Witt. Louie means Warrior – Steven means to surround or encompass and Wit(t) translates to white. Roughly interpreted then the name could read: The soldier that covers everything white = The Whitewasher. Now that is a coincidence. A researcher could be forgiven for wondering if Witt was spirited away after the hearings and put into a witness protection programme or if Witt every really existed at all. Louie was born on October 20, 1924 and passed away on Monday, November 17, 2014. Louie was a resident of Rockwall, Texas. Well he did say he was a very private person! Was Witt the Umbrella Man? It’s possible but seems extremely unlikely. If computer analysis could not match Witt’s Face to the images in the film and photos it seem incredible that a few friends could do this 15 years after the event. Also, even if Witt had shunned away from the assassination after the event out of shame or fear his Dallas friends certainly hadn’t. Why had they failed to identify him before? Perhaps if people had more information about Witt and the authorities had examined his life as they did to Oswald and Ruby then the public would know a lot more today than they do. Strangely, the media grabbed the story and ran with it without seeming to challenge it at all. At best this was very lazy journalism and at worst it suggests they had a motive not to dig deeper. It seems as if the mystery of the Umbrella Man isn’t quite solved after all.